I have come to realize, and subsequently preach, that the only people who make progress are those who persist. That’s all. 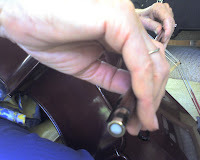 These are the bow grips of two of my students who are valiantly struggling with the subtleties of the bow grip, and I snapped these photos in a moment of “Wait, wait! That’s perfect!” I am so proud of these two that I had to post them. They are both adult beginners, and have trusted me with my policy of Technique First, Sound Second. Of course, a week into this new bow grip, their sound caught up with them, and is more radiant and polished than it ever was before. Just like mine was when Ron Leonard unceremoniously dumped my bow grip and gave me a new one…on our first lesson. It took me about 2 months to regain my sound, but he is directly responsible for my current approach, and my faith in technique uber alles. Who was responsible for his approach, you ask? Leonard Rose. Good enough for me! Ooo nice. I wondered whether my bow hold was leaning too much on my index finger but I don’t think so based on those photos. Though my orchestra tutor and my teacher disagree on where you put the tip of your thumb. My teacher told me to put it right back in the curve of the frog (I’m sure it has a technical name I don’t know) and my orchestra tutor suggests putting it on the top edge of the frog, right where it meets the top part of the bow (is this making any sense?). With my bow putting my thumb up on the edge of the frog is uncomfortable, but I don’t know whether I’m just not used to it or what. I’ve tried other peoples’ bows out of curiousity and it’s more comfortable on theirs… oh blah. What do you think? Terry: To me, technique means the way one actually does something. So bow technique is the way your hand/arm physically touches and moves the bow. By talking about it, we try and turn that into an approach which lends itself to regularity and the ability to be consistent. So when I give my students an “all technique” lesson, I am physically moving their hands on the bow, adjusting positions, and putting the way something sounds on the back burner. Technique leads to consistently good sound, but when you change it, the sound can suffer for a while. I would say that technique is associated with method, habit, cogency, concept and plan. I would say that it is not accident, related to talent, or how many hours one spends at the instrument. Maybe this is the best way to think of it; technique is silent. 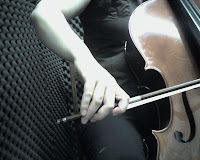 You could watch someone with efficient, reliable technique silently move their hands over the cello, and still tell that they had great technique. What a question!! You actually expect me to know something? Sheesh! I hope this was a little help. Erin: Well, the school of bow grip I subscribe to is one that emphasizes the index finger. Well, it emphasizes a shape to the arm that results in a rotation onto the index finger. The thumb is a tricky one, and changing where one puts it is so scary! Still, I ask my students not to be too precious about experimenting with it if their current thumb placement is not working. Different bows (by and large) have similar frogs but what makes them feel so different is the balance point, which in turn, makes it feel heavier or lighter. One thing I notice is that if I have someone move their thumb, the other fingers have to adjust a little, too. Jacqueline du Pre’s hand was pretty much the perfect exemplar of the rotated style of grip I tend towards. It’s so loose, that a lot of the time, the thumb is allowed to straighten and bend, and I find that having that mix of flexibility and strength is what makes playing the weighty parts of the repertoire possible. My thumb used to kill me before Ron got to it. Thanks for the ideas Emily, I will go check out the YouTube. Though I think I’ve subjected myself to enough Legend of Zelda music for the rest of my life. I'm reviewing your earlier blogs for more inspiration..which I always find. Now that I'm playing more and attending my daughter's cello class, I second guessing everything I do. For a while now I've been pondering my bow grip. (Probably since your post this summer…when you suggested I look at other bow grips) I don't have a teacher at present, so I ponder on. I think my grip is good…isn't it? Maybe not??? I think it looks like some I see…I don't recall a problem with it since I was 10…maybe a minor adjustment in college…by my teacher…who studied with…Leonard Rose. I also appreciate your comment about the thumb. During "cello class", a fellow mom asked me if her daughter's grip was okay as this was the first day of bow grips and she was in the back row. I suggested a slight adjustment to her thumb so it was more like mine now. (Her thumb looked like mine when I was 9 or 10 when I did have an achy thumb…) Then I saw the teacher's thumb and freaked out because I might have ruined this poor child's cello technique forever! I think I'll focus on some other technical concern, at least for now… I have plenty others to choose from! As always..thanks for your inspiration and practical help.